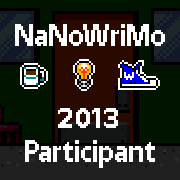 This entry was posted in NaNoWriMo, Writing and tagged Dragon, NaNoWriMo, Speech Recognition Software. Bookmark the permalink. That made me laugh out loud. It reminds me of that game, Mad Libs, where you read off a sentence that’s written in homophones. I love that game, even if I’m not very good at it. Fernanda Reimann. Maybe you should name your MC that, at least for the month of November. Haha! After the initial frustration, I was saying stuff just to see how Dragon would twist it. And I googled “Fernanda Reimann” just to see if there’s a real person with that name. Yep. At least one, down in Chile. Come NaNo: Feverish typing it is!! Yes- dragon is awful. The voice recognition on iPhone is amazing. I use it when I’m driving or just don’t want to type. The. I email it to myself and copy paste it to my document. Cause you never know when an idea is going to charge the gate. Alas, I must suffer with a low-tech dumbphone. When I grow up, I want to be just like you!